The London Diving Chamber is used to welcoming many a diver through their doors on a daily basis for dive medicals, chamber awareness courses and, less frequently, for DCI cases. However did you know that operating at the heart of LDC is also a crack team of training extraordinaires running a dedicated diver-training facility? LDC Training. 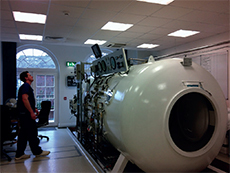 a hyperbaric chamber on site, LDC-T specialise in providing courses for the offshore, commercial and recreational diving communities. 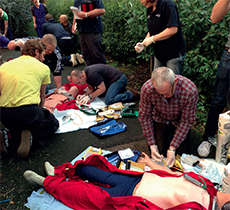 a variety of scenario-packed courses that are bursting with relevant and, most importantly, practical information. Ian is a critical care and trauma nurse (as well as experienced PADI Divemaster) and having worked for the NHS and the Royal Army Medical Corp, the latter of which took him on a tour of Afghanistan and Iraq, it is fair to say that there is very little in the accident and emergency world that Ian has not had to deal with first hand. to the world of saturation diving. On top of the commercial diving résumé, Bill is also a PADI scuba instructor, electrician and holds a Diver Medic Technician (DMT) and Immediate Life Support (ILS) qualification. With this caliber of staff residing at LDC-T it is not hard to see why their IMCA approved DMT course has become such a success with commercial divers. Since opening their doors in 2011, LDC-T has been consistently busy training divers on the popular 2 week-long intensive training course and this looks set to continue well into 2013. Today we are sitting down with Bill and Ian from LDC-T to talk about the Emergency Scuba Medic course. The ESM is LDC-T’s bespoke course that is specifically designed for recreational divers and dive leaders/instructors. Why do you think divers should be interested in taking the ESM course? Ian: Our initial thoughts behind creating the ESM were to expand on the success of the DMT. The skills that we teach commercial divers during the DMT are obviously very intense and need to be at a very high level but many are also essential life saving skills that we realised were transferable and relevant to the recreational diving world. Bill: It’s true; we wanted to transfer some of the knowledge and experience we have picked up from running the DMT course to the recreational diving world. From our own experience in the recreational industry, plus from our time at the chamber treating divers, we have realised that there is a gap in the knowledge base of the industry. Particularly for people running dive expeditions or travelling to remote areas where medical and chamber support can be at best, dubious. This course is ideal for someone that is frequently in the water, perhaps a dive leader or instructor, who wants the skills required to be able to take care of their team or students in an emergency or remote location. Everyone at the chamber, and probably reading this magazine, will know the multitude of things that can go wrong, even in the most seemingly straightforward of circumstances. Being able to deal with the situation swiftly and effectively can often mean the difference between life and death. to get out of the ESM? Bill: The course is 3 days long, so not as classroom intensive as the 10 day IMCA DMT, but we pack in plenty of practical scenarios and cover all of the areas relevant to Scuba medics. The basic areas we cover are: HSE emergency first aid, oxygen administration, AED operations and PADI chamber awareness. Ian: Our method of teaching is very hands on, just like our own experience. We learnt to deal with emergency situations by being in them and recreating realistic scenarios seems to be the most effective way that our students learn. Emergencies are by nature chaotic and stressful and you won’t learn how to deal with that by reading a book. Bill: We like to break up the theory into shorter chunks that are mixed up with practical scenario training. These ‘role play’ scenarios (not that sort of ‘role play’! ), thanks to our comprehensive training equipment, can feel very real and get very messy. We recommend bringing some old clothes! What separates you from other training facilities? in all seriousness Bill is right, our experience is what makes our courses unique. Divers on the course respect Bill’s experience as a former RAN and sat. diver and know that our course content is derived from real life situations and not just lifted from the pages of a text book. It’s important to us that people get the most out of the course and actually learn skills that they can apply in real life situations, not just remember the theory behind it. If you’re an active diver or instructor I highly recommend that you look into doing a course such as the ESM, it’s a fulfilling and highly practical way to improve your skill set. 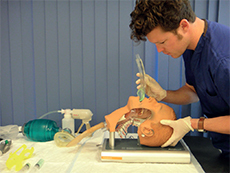 The ESM course is 3 days long and costs £395. LDC-T will also be attending LIDS on the 23rd and 24th March at London’s Excel and will be on stand 430 with the London and Midlands Diving Chambers. People who book onto the ESM at the show will receive a special show discount of 20% off the above price. LDC-T is situated at the Hospital of St John and St Elizabeth in St John’s Wood, London. They run a variety of diver training courses and are also able to offer bespoke courses for those who require it. For more information please visit their website or to speak to a member of the team call 0207 806 4021. Additionally, find them on Twitter.